I love seeing young girls take up sewing and learning from their grandmother so it was super special when Julie posted this photo in my Facebook Group. It shows the gorgeous pinafore dress that Julie’s 12 year old granddaughter made as part of our September Sew-Along. Julie is obviously doing a wonderful job teaching and she has an awesome student so I’m sure they will make lots on precious memories sewing together over the years to come. Julie, please pass on my biggest congratulations to your granddaughter, she should be so proud of her effort. The I received this email from Lauryn that absolutely made my heart sing! ‘Hi Rosie, I’ve mastered the collar!! Thanks for your great videos, I find they help so much! It’s just under a month since I learned to sew and I actually had no intention to, I have an autistic son who got a sewing machine for his birthday and I had no idea how to use it to teach him so I taught myself and we made a couple of small things together. I realised I really liked it! 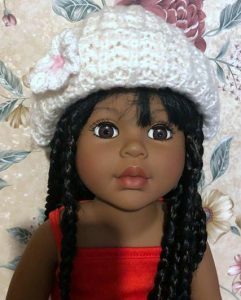 My daughter is getting an Our Generation doll for her birthday next month so I can’t wait to give her all the clothes I will have made! 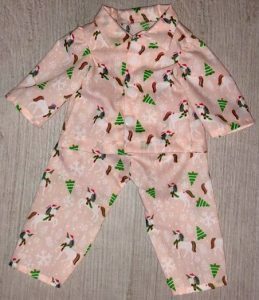 I’ve attached a couple of pics of pyjamas, they’re not perfect but I’m really pleased with them! Thanks again! I can just feel the pride and joy that Lauryn was feeling jumping out from this letter. It’s awesome to hear that my videos have helped her achieve such great results after such a short time. Go Girl! What a truly wonderful reason to start sewing and I do hope her son enjoys it as much as she does and maybe her daughter will give it a try too. Just imagine the fantastic memories they will all create together! I’m so looking forward to hearing from Lauryn again to find out what she masters next. I love that Julia has repurposed an old sweater to make my Free Beanie pattern. 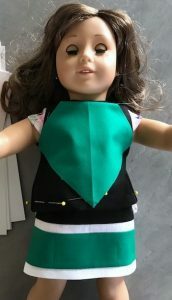 It is such a quick an easy pattern to make and can be made from lots of different fabrics from polar fleece to a jersey knit to knitted fabric. ‘I couldn’t wait to try Rosie’s free beanie pattern. The videos were, as usual, great and easy to follow.. Thank you Rosie!!! Julia, it looks like you spent hours hand knitting that gorgeous beanie. Well done! Karen has done an amazing job recreating a replica of her neighbours cheerleading outfit. I can just imagine how excited she was to receive this for her birthday. Well done Karen! ‘I absolutely love your videos that accompany your patterns. It is so much easier to see what I need to do rather than just read it. I have never made clothing before, you make it easy! So happy to have found you!! 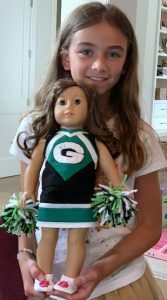 For the cheerleading outfit I used the basic 3 Way Skirt, the top of the pattern is in black material. Then I split the bottom half of the pattern into 3 sections to make the green and white bottom of the skirt. For the top I used the Crop Top shown over the red skirt on your web site. I made it a little longer. 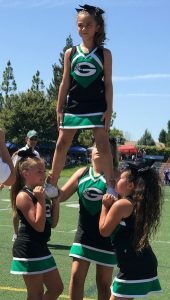 The green square with the G on it and the white stripes I made separately by looking at her picture in her uniform then placed it on your crop top. That’s it! Oh boy did we have some amazing Halloween creations during our October Sew-Along. I just love, love, love what Robyn created using my Overalls for All Seasons pattern. She did fancy stitches all over the overalls and made this super colourful long sleeve shirt from my Blouse pattern. 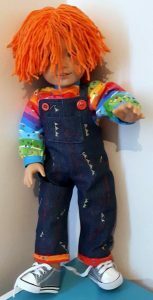 She completed the look putting matching trim on the overalls and topping it off with a cute wig made by stitching 8 ply acrylic to ½” wide cotton tape using small stitches. The best part is everything Robyn used she found in the bottom of her cupboard! I cannot help but smile when I look at this photo, it just screams FUN! And here is another more ‘traditional’ wedding dress. 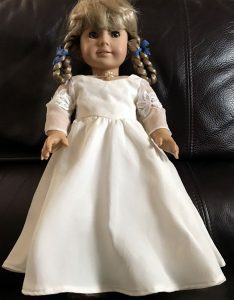 Becky has used her and her mother’s wedding dresses to create some very special wedding gowns that will help keep wonderful memories alive and be passed down through the generations. What a wonderful idea and absolutely precious! I finished the doll dresses yesterday for my mother’s great- granddaughters. I made a total of four dresses and they are all alike. My mother was VERY tiny when she got married so I didn’t have a lot of material to work with. Two of the dresses are entirely of her material and two I needed to use some of the fabric from my dress that I had already cut apart. I did have to make some alterations on the skirt size in order to have enough fabric but it worked. The necklace I made with a rosette-type flower from her veil headpiece. The veil itself is too far gone to do anything with it. My mother was married in 1941 so the fabric is age worn and very delicate. I hope these girls will appreciate the dress and keep it as a memento to share someday with their daughters. Thanks to everyone who contributed to my Share and Tell this month, there sure was some amazing and inspiring stories. 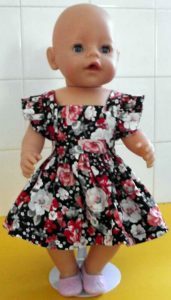 If you wish to start making your own memories and need a little help ‘teaching’ your young ones how to sew, or if you need a little guidance sewing small doll clothes yourself, then now’s the time to save 20% off my How to Make Doll Clothes video course with my Christmas special. Or if you just want to purchase some of my wonderful patterns with video support then you can save 20% on those too. Simply use coupon code CHRISTMAS during checkout. Offer expires December 25, 2018. They are all wonderful. I especially love the little dress that Julie’s granddaughter made and the Halloween entry by Robyn. Great job everyone!